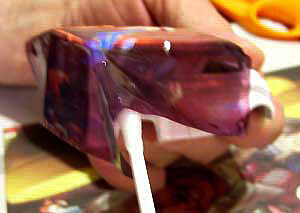 Here is explained how to wrap water-slide decals. Choose the right paper: 1) Most laser and inkjet printers will take clear or white. We do not recommend wrapping white decal paper over difficult surfaces. 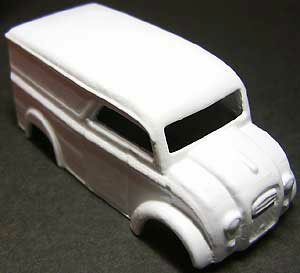 Instead, mask off the decal area and paint white, then decal with clear paper. • For small jobs, it is best to cut your paper just before using it into half or thirds, as long as your printer can print on a short sheet. This saves paper. The decal paper may curl (if exposed to humidity) and can jam your printer, so BE SURE to uncurl your paper. A quick way to do this is curl it in the opposite direction for about 10 seconds just before putting into your printer. • Open your graphics program and prepare the image however you wish. For best results, do not resize, although you may crop. When you print, that is when you will resize. Using a tape or ruler, measure the exact dimensions for your decal. So use 1/8ths or 1/16ths if possible. • When your photo is ready, place the decal paper in your printer, shiny side up. 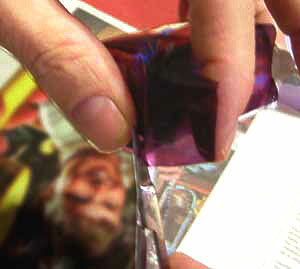 Clear laser paper may have a tissue overlay, so take that off. When you press "Print" on your computer, you should be able to print at a percentage. If you can't, then resize your image to decal size now. To get the highest quality, though, calculate the percent reduction in this way: Divide the width or height of the decal area by the width or height of the image: A 2-inch wide decal divided by a 6-inch wide image will be printed at 33.3% reduction). • Another selection on your print setting is quality. If this is your first time, you will probably have to try it a few times. Most decal paper can accept at least "Transparency" setting, which is "medium" to "fine" or around 720-1440 dpi (dots per square inch). Kustom Rides has tested all its papers to accept "Photo" quality, or "fine" to "superfine" or 2880 dpi. a) Decrease the density or saturation of your print setting. b) After the image is printed, quickly spray just enough clearcoat, like Krylon Crystal Clear, to seal the ink before it runs. 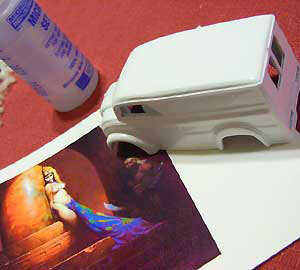 After the image is dry, spray some more clearcoat until the paper has a gloss shine. c) Turn off your printer and give it a rest. Temperature can also affect how the ink lays down. d) Try another sheet. Sometimes decal paper can be damaged by the elements. 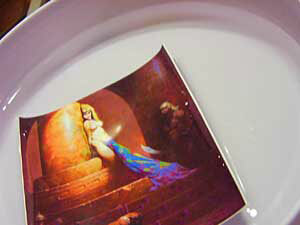 • With laser decal paper, your image is ready to use right out of the printer. 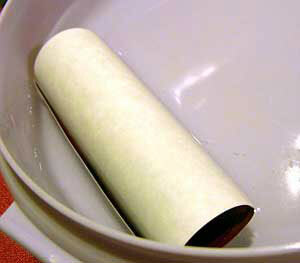 With inkjet paper, you will spray it before using (about 1-hour to 1 day before). We have found that almost any clear spray will work to seal decal paper. 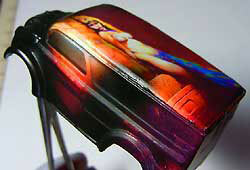 If you plan to finish your project with a varnish clearcoat, use that also to spray your decal. 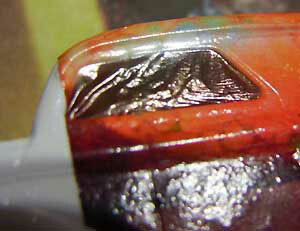 If you are using an enamel clear spray, that will work too, and same goes for acrylic, lacquer and urethane. Urethane is the best finishing clearcoat of all, and we have used it to clearcoat over acrylic, enamel, lacquer and varnish. Acrylic does last longer than a year before cracking indoors, so it's not a good finish. We use it only to spray the decal after it's printed. • Cut your decal so there is at least a half inch around it. Then in a garage or ventilated area, hold it with pliers or something and spray it once or twice so the decal has a wet shine. Let dry and use within 24 hours. • Get a bowl of water out for dipping your decals. It can be cool to slightly warm. Cut decal first to its edges. Have your surface ready and place the decal in the water. Don't worry about it curling up at first. In 15-60 seconds, the decal will be ready to take out. Remove it if you see any edges coming up. • Apply Micro Sol to the surface using a Q-tip. This helps mount the image and soften it. Align your decal over the object and carefully slide it off. The easiest way is to slide the paper from underneath the decal. If it is a large decal, have someone help you to smooth it out as you pull the paper. 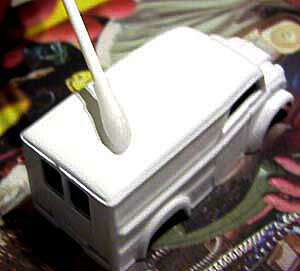 • If you used white decal paper, you may wish to paint in the edges before finishing up. 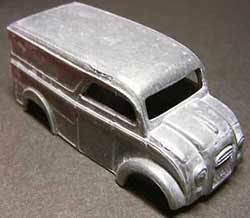 If you have an airbrush, you can use this to blend in a decal to its surroundings. 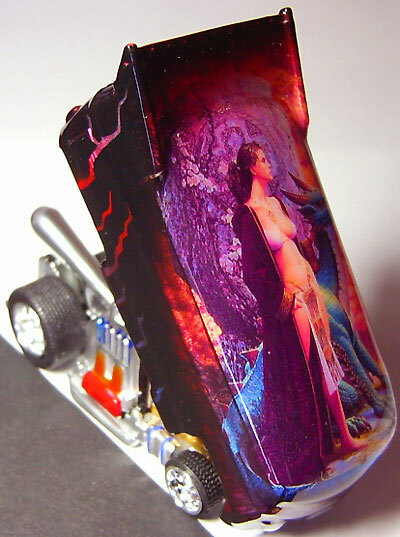 • The last part of any decaling job, whether using inkjet or laser, is to cover the project with a clearcoat. This gives it a nice shine and also protects the image. 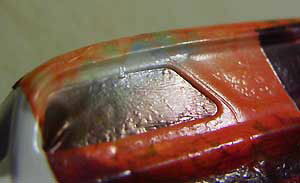 There are three methods of clearcoating, but the most common one is with a spray can. It is also the easiest. The other two are airbrushing and hand brushing. • This is the last part of your project, so you want to be careful. This is best done in the garage when it is not windy and the temperature is between 65° F. and 110° F (18° to 43° C.) It is best to start off with a light coat of clear. You want to avoid creating drips. If you spray too much and get a "wave" or bead of clear, it is possible to recover: Spray some more clear on the area until it smooths out (you will have to move your object around until the clear hardens, otherwise you may get a sag). • Let dry between coats. You will be the judge of what is enough. When spraying, if any dust or particle gets on the surface, stop and use a toothpick to lift it out, then resume spraying.